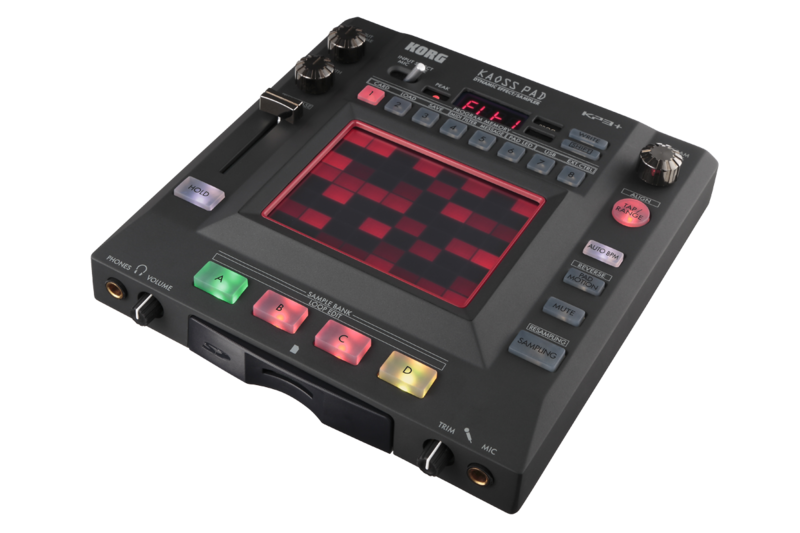 A real-time effects processor/sampler with instant control over cutting-edge effects. 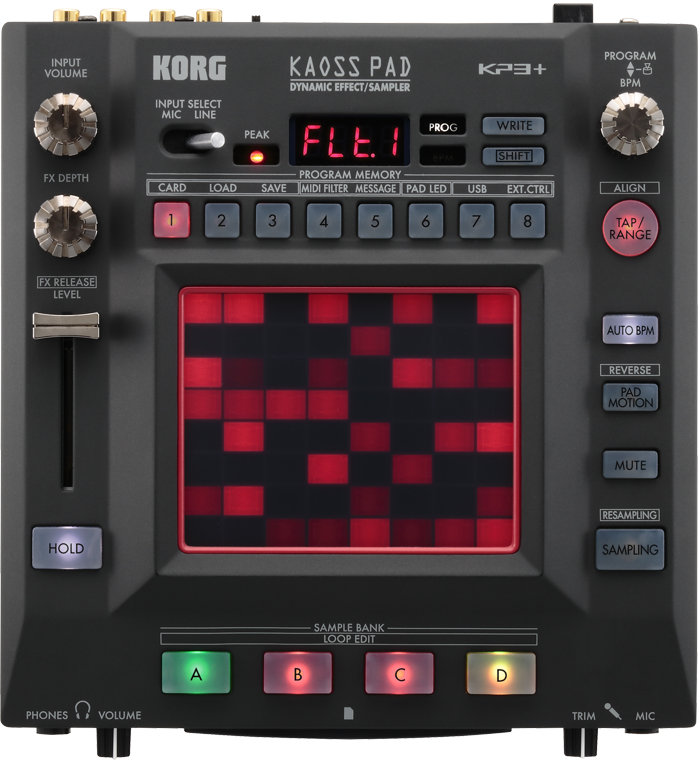 The Kaoss Pad series of effects units is famed for its intuitive touch-pad interface. The flagship model KP3 that appeared in 2006 was highly acclaimed by musicians and DJs around the world for its powerful, instantaneous effect programs and its wealth of sampling functionality. The sounds that drive the electronic and EDM music movements, and the effects used to create them, have evolved significantly over these past seven years. The effects combinations which have become a staple in numerous genres and applications thanks to the KP3 have been taken to a new level with the new KP3+. 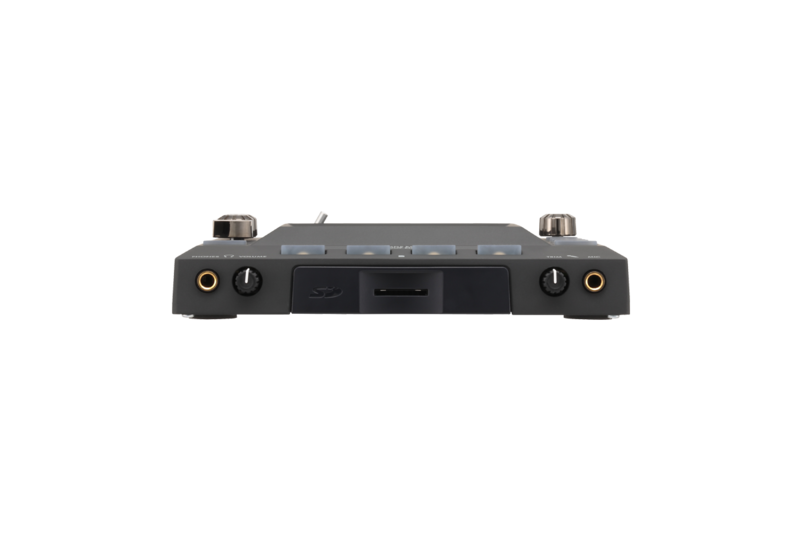 The KP3+ is a real-time effects unit that will generate the sounds of modern electronic and beyond. 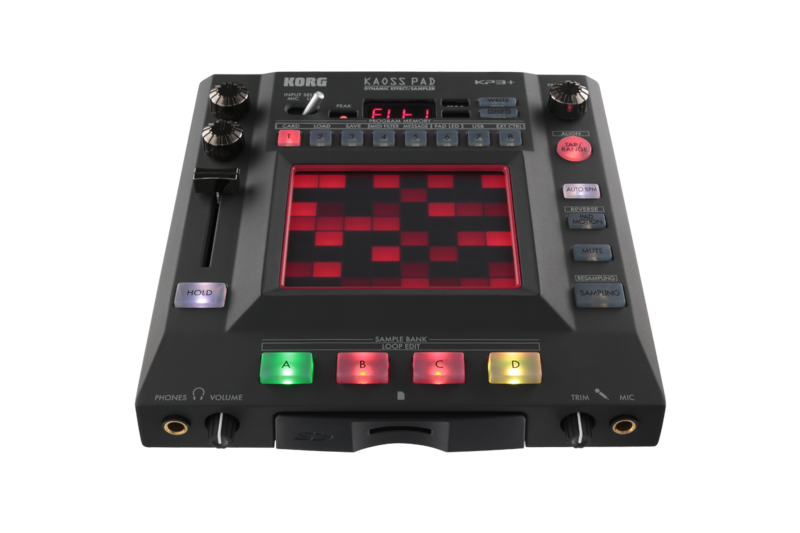 The intuitive design and amazing flexibility of the touchpad allows Kaoss Pad 3+ users to easily control multiple effects and parameters by simply tapping or rubbing the Kaoss touch pad with their finger. Using this remarkable design, you can easily control multiple effects in complex ways that would be difficult or even impossible on a conventional effects unit or would require dedicated software plus a MIDI controller to achieve. 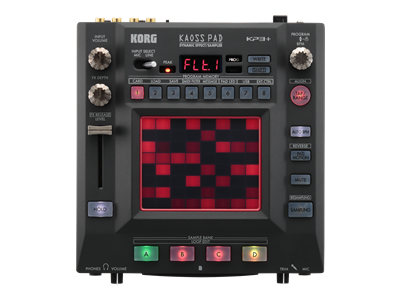 The KP3+ provides new effect programs that are worthy of its status as the flagship model of the Kaoss Pad series. The KP3+ contains a total of 150 programs – 22 more than the original KP3. In addition to the 108 effects carried over from the KP3, which include filters, spatial-type effects such as delay and reverb, a grain shifter that freezes tiny pieces of sound and repeats them, and a vocoder, there are 42 new or improved effects that represent today’s dance music scene, including effects that were newly developed for the Kaoss Pad Quad, such as the Looper, Vinyl Break, and Ducking Compressor. It’s easy to obtain the scratch sound that’s heard when you scratch a turntable, or use a record-stop effect. In addition to the basic Mod.1 Vinyl Break, the KP3+ also provides the new Mod.2 Break Reverb which adds reverb to the effect, and the LoP.2 Break Looper and LoP.8 Loop Breaker effects which combine the effect with a Looper. You can use a side-chain effect to emphasize the backbeats of the kick. In addition to Mod.8 Ducking Compressor, there’s a new rEV.1 Pump Reverb that adds a reverb effect. You can add a sense of “breathing” to your music by dynamically varying the reverberation in synchronization with the BPM. New effects include dLY.2 Echo Break and rEV.3 Reverb Break, which mute the input sound and generate delay or reverb. These are ideal ways to create breaks in your DJ play. We’ve also enhanced the synth sound effects that are effective when used during a break, bringing them up to date for the evolving dance music scene. Newly added sounds include Syn.3 Pump Noise (noise without resonance, processed by a side-chain effect) as well as Syn.4 Lofi Synth and Syn.9 Resonator. Other added effects include FL.16 Center Canceler for partial vocal cancellation, LFO.1 Jag Filter which uses a non-resonant filter to chop the sound, dLY.5 One Delay which shines on styles such as hip-hop, and Grn.6 Stutter Grain which alternately applies a grain shifter and a Looper. We completely rethought the X-axis and Y-axis parameter assignments and their polarity, and included flashy and glittering synth sounds as well as many more effects that will enhance the latest sounds of today’s scene. 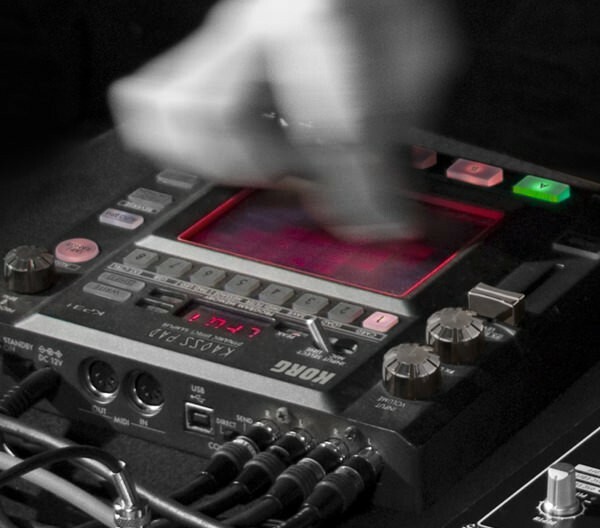 The FX Release function automatically adds a delay to smoothly blend the effect when you release the touchpad. The Mute function cuts the input sound, leaving only the reverb or other effect sound, and can also be used as a “transformer” by turning it rapidly on and off. Pad Motion lets you record and play back the movements of your finger on the touchpad. The pad LEDs illuminate along the path that’s traced by your finger, letting you perform without difficulty even in a dimly lit DJ booth. We’ve modified the way that the four sampling bank LEDs illuminate to make them more intuitively understandable than on the KP3; they now light up red during recording and green during playback. The KP3+ features enhanced sampling functionality that lets you perform using multiple effects and samples. 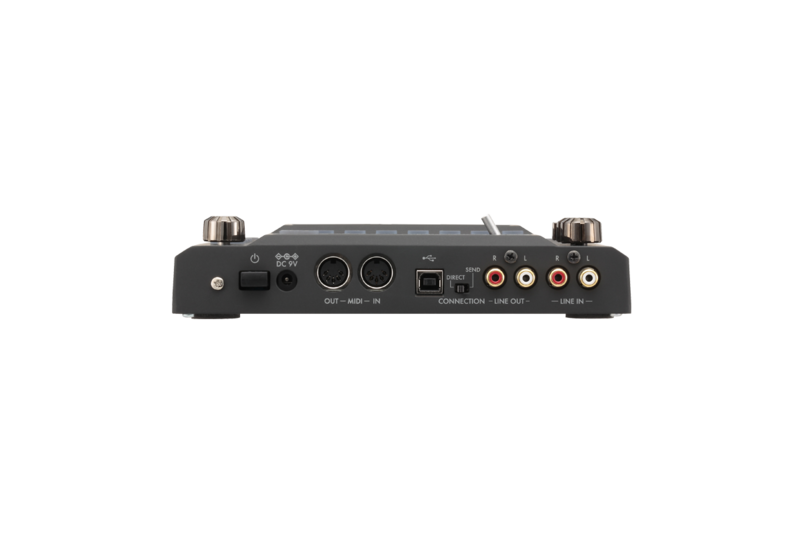 Each of the four sample banks can record a sample up to 13 seconds long (*1), and play it either as a one-shot or loop. 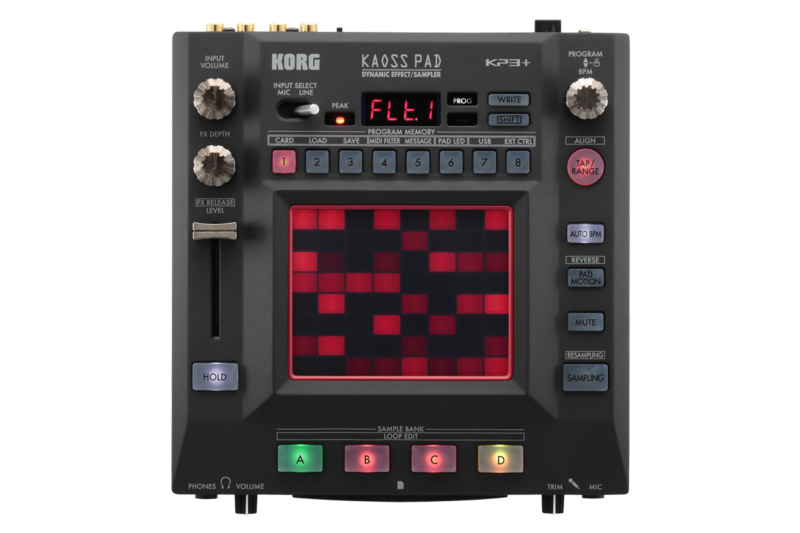 The KP3+ also has functions such as a start point adjustment that lets you create a half-beat shift to create “doubled” effects, a new slice function that edits the structure of a loop sample to instantly create completely new phrases, and a resampling function that lets you apply an effect to a sample and then re-sample the result.